“You Must Believe in Spring” is an indispensable part of the huge recorded output of Bill Evans, for musical reasons, but its significance is otherwise noteworthy as well. It was his first date for Warner Brothers, after a long and fruitful association with Fantasy Records. Recorded in August 1977 at Capitol studios in Los Angeles, but not released until early 1981 -- it was also the first album released by any company after the pianist’s death in September 1980, thus adding to the bittersweet experience of listening to its beauty, for those of us who first picked it up on vinyl back then. It still holds up as one of the most "billevans-ish" albums there are, to coin a phrase: so many of the unique qualities ascribed to his playing over the years can be found right here in this recording. One of the most-loved of his records (which came in at #9 on Billboard's Jazz Charts in 1982) , it was also the last session Bill did with bassist Eddie Gomez, who amicably left the trio soon after these dates after an eleven year tenure, to pursue other projects. Appearing on Marian McPartland’s “Piano Jazz” show in 1979, Evans spoke of this then yet-untitled album, in that it was already “in the can” and he specifically remarked how well Gomez played on the date. Even among bassists, and other working musicians, it’s still a wonder how he was so finely tuned-in to not only Bill’s melodic ideas, but to his freely played rubatos -- knowing where to come in on a chord change, or where to land in close sync with the piano, even though the tempo might be so slow (as in many intros) as to be essentially undefined. This CD is evidence of just how much Gomez had grown as a player, and of his often symbiotic interplay with Bill. This remastered reissue is a gem, and with its three “new” tracks, it is almost foolhardy not to have it. It was already one of the more well-regarded Evans albums for its absolutely superb sound quality, as engineered by veteran sound wizard Al Schmitt, whose amazing work on Steely Dan’s “Aja” (also 1977), George Benson’s “Breezin", Natalie Cole's “Unforgettable” , and so many others has been highly praised. Schmitt just won another Grammy this year for Diane Krall’s “The Look of Love”. Tommy LaPuma, Schmitt’s partner in so many projects, co-produced these sessions with Bill’s usual producer/manager Helen Keane. Their touch is critical to the album's success: The piano is crystal clear and rich and warm, has a nice touch of appropriately added reverb, and this remaster brings out more of drummer Eliot Zigmund’s tasty and unobtrusive drumming contributions , and Gomez' aforementioned bass work. And what of the music? Those familiar with this album may want to skip ahead in this review, but for the uninitiated, it should be noted that the tunes on this record fit together so well, it’s almost a “concept album” . There are two exquisite Evans originals: the luxuriously linear beauty and deep harmonies of “B Minor Waltz” (For Ellaine)” and the deeply felt, minor key dedication to his beloved brother Harry, “We Will Meet Again”. Both are wistful and searching in mood, and are models of intelligent songwriting constructs [Piano players: see Jack Reilly’s analysis in his “Harmony of Bill Evans” book] . Not a note is wasted compositionally or in the solo of "B Minor Waltz"; it's evocative of Chopin and Erik Satie and refreshes the soul with each listening. Both tunes evoke the feeling of reflection and rumination, their inner chord voicings moving with perfect logic. This is as it should be - his brother was a tragic suicide, and so was his former girlfriend Ellaine. That Bill Evans was so often able to distill such singular and personal communicative beauty in his music from the deeply painful tragedies of his life has been often commented on. So much naked and emotional clarity is here in these performances, and like other jazz giants such as Bird, Billie Holiday, Miles and others, it came out in the playing. But rarely has it been as keenly felt and profoundly noted by listeners -- so many who have responded, as if they were the only ones able to understand what Bill was communicating. As pointed out long ago by Gene Lees, Orrin Keepnews and others who knew Bill well, this has long been a common phenomenon among Evans fans. Such was his genius, and the rare mark of a true artist. The late pianist Jimmy Rowles wrote the gently exotic “The Peacocks”, and its graceful falling melody provides more room for Bill’s contemplative chromatacism. He had played it previously with Stan Getz in 1974, but this is the first time he did this superb composition under his own name. According to biographer Peter Pettinger, Rowles -- who was thrilled at Bills’ recording of his tune -- went to see the trio at London’s Ronnie Scott’s nightclub, and went backstage to see Bill, who told him he had just missed their performance of it. After that intermission, Evans decided to play it again, as a courtesy, and even introduced Rowles, even asking him to take a bow. This is the kind of gentleman that was Bill Evans. Back in 1958 when Bill was with Miles Davis group, he played on some of the leader’s sessions for an album arranged by then -newcomer Michel Legrand (available as "Legrand Jazz"] . Legrand went on, of course, to be a noted pop composer, and Evans was attracted to his writing style in later years, recording such tunes as “What Are You Doing the Rest of Your Life” , “We Will Meet Again” and the title tune here. He knew it well from doing a version with Tony Bennett, and it’s an ideal vehicle for Bill’s interpretation, what with its extended melodic cells and the often surprising chordal movement. Critic Francis Davis notes that it was an inspired choice for Evans “because its inner structure mirrors so many of his improvisational strategies” . This version has obvious edits, the album credits indicating they were done by Columbia Records engineer Frank Laico back in NYC (the bass solo immediately following the melody, for one) though they seem perhaps a tad smoother in this excellent remastering. “Gary’s Theme” , a latter-day Evans repertoire favorite of great delicacy and precision -- is by the pianist’s old friend Gary McFarland, with whom he did an album for Verve in 1963. Often called “Gary’s Waltz” when Evans played it ‘live’, it's another stand-out in the Evans catalog, and sounds almost like it was written for him specifically. Bill pores carefully over every note, the concentration so apparent, it virtually comes through the speakers. The song uses a common tone in the bridge’s melody, over which shifting harmonies weave the tale. Those familiar with "The Tokyo Concert" album may note a resemblance in Bill's approach to "Hullo Bolinas" from that record. The last tune on the original release offered the pianist’s first recorded version of the theme from “M*A*S*H” -- which was to become a staple of the last trio’s repertoire from then on. Bill takes the theme through several keys it at a medium pace, with a quasi-Latin feel in the drums. It’s one of those tunes that Bill enjoyed just playing the head for, without soloing over the chords -- just improvising over the eight bar intervals between key changes. Though surely more reserved than later performances, it works well here in its first recorded outing. Later takes with Philly Joe Jones (in Europe) were far more aggressive, as were live versions with the Johnson and LaBarbera trio, so its interesting to listen to this first reading. The old Vincent Youmans - Billy Rose standard “Without a Song” is the first of the three previously unreleased tracks. Bill does a superb solo introduction, adding some of his own rich reharmonizations, and you wonder why he didn’t get around to recording this old chestnut before. As the swinging feel steadily increases, Eddie Gomez’ interplay and solo spots are stellar, and Zigmund is given room to stretch out here (which we didn’t get to hear in the original album). The one “Kind of Blue” track Evans didn’t play on in that landmark Miles album was “Freddie the Freeloader”, and is featured here with some electric piano (which seems an unnecessary choice, considering the superb quality of studio's acoustic piano ). It's a blues, of course, (only altering the last chord) and Bill was not known for his blues playing, preferring far more advanced structures to hang his tapestries on. Still, its a fun romp through the changes, and more extroverted than the other tracks on the date -- as is “All of You” , an Evans perennial since 1961’s Vanguard sessions. The trio interacts with great flair, as Bill's lines often pounce against the groove in rhythmic displacement (a favorite technique he expounds on in that Marian McPartland show in 1979). 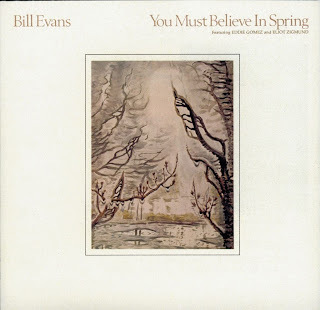 “You Must Believe in Spring” may well be one of Evans’ greatest trio records -- and perhaps one the all-time great “rainy day” albums. And with the significant inclusion of these three previously unreleased tracks, we get to have some sunshine too, after remembering the rain.